This month’s Challenge for Dreamweaver Stencils is to design something for Valentine’s day, and I thought I would do something other than a card this time! 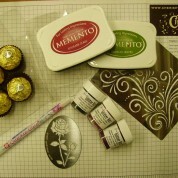 After all, you can use your stencils for more than just cards! 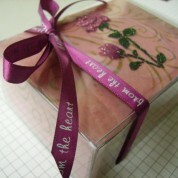 And this Acrylic box is the perfect container for whatever your Valentine’s favorite treat is. 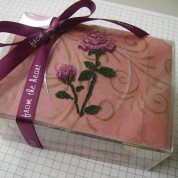 Using the Silicone mat and Impressions pad, Emboss the Acrylic lid of the box with the Rose Stencil. I ran it through with an extra shim as my acrylic is quite thick and I wanted a deep impression. 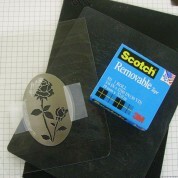 The Removable Tape helped keep the Stencil from shifting on the acrylic as it ran through the machine. 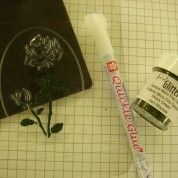 Using the Quickie Glue Pen, on the De-bossed side of the acrylic, I added the glitter, one colour at a time. 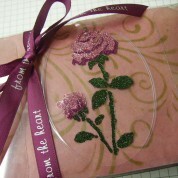 I used Burgundy Microfine Glitter as a shadow on the petals. Then I added Rose Copper Microfine for the remainder of the petals, and Moss Green Microfine for the stem and leaves. 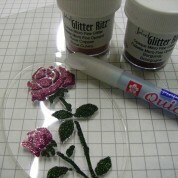 don’t forget to use your Glitter Gone Mat to clean up the Glitter left on your workspace! 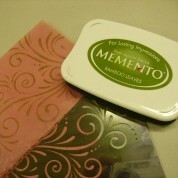 Using the Flourish stencil and Bamboo Leaves Ink Pad, I stenciled the Pink Tissue paper with a Dauber to give it more character as it will be seen through the acrylic box. 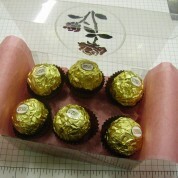 Put the Acrylic box together, fold in the tissue paper and add the chocolate! After I had it all together, it still needed a little something, so I added the Pink Ribbon with the words “From the Heart” on it. How lucky was I to have the perfect ribbon for this project! I absolutely LOVE how the outside oval shape of the stencil embossed into the Acrylic giving the image the perfect border! This entry was posted in Dreamweaver Design Team Challenges, Tutorials and tagged BigShot, card, Dreamweaver, Embossing, Glitter, Sizzix, Stencil, Tutorial. Bookmark the permalink. Very pretty project. I could see using this idea a lot.